One implication of Brexit was the possibility that the result fundamentally reshapes the UK body politic and fractures the political contiguity of the state. The renewed calls for a second Scottish independence referendum give life to these concerns. The Scottish First Minister, Nicola Sturgeon, has demanded a new referendum before the Brexit vote. While PM Theresa May has rebuffed the request, the pressure for a new referendum is unlikely to ebb, especially given the strange state of UK politics: a Premier whose longevity may rely on acceding to the demands of a cohesive group of Conservative Party MPs who demand a hard Brexit; a main opposition party in a state of crisis and which has thus become a key enabler of the government’s push for a hard Brexit. Since Scotland voted to remain part of the UK on the 18th September 2014 vote, by a 55.3% to 44.2% margin, events have changed sufficiently to embolden calls for a re-run. 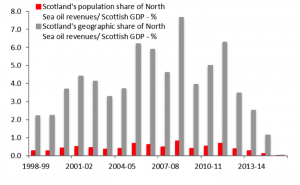 In 2014 there was an overwhelming economic rationale for Scotland remaining in the UK. As we discuss in more detail below, independence would have required a multi-year period of aggressive fiscal austerity. Moreover, an independent Scotland would have lost access to the EU until it was able to renegotiate accession as a separate state. Clearly, Brexit has turned these dynamics on their head. The UK government is embarking on an aggressive multi-year period of fiscal austerity, which in the likely event of a hard Brexit could entail a marked winnowing of the welfare state. 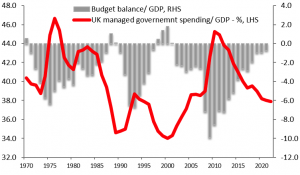 (The UK budget – hitting an economy when it’s down.) Scotland’s choice is no longer fiscal largesse or austerity, but which of the two austerity paths they wish to tread. Similarly, remaining part of the UK means losing access to the EU contrary to the country’s vote against Brexit. The risk of a Scottish independence referendum Mark II is therefore yet another uncertainty for the UK economy and the GBP to traverse. As such, it is worth analysing the Scottish economy to gain insight into the economic issues that would (or should) dominate the coming debate, and to also understand the likely choice that an independent Scotland would have in terms of exchange rate regime and monetary policy framework. 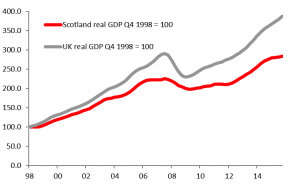 Compared to the UK as a whole, Scotland has experienced a laggardly growth performance. In Q4 2016, Scottish GDP grew by 0.7% Y/Y, or less than half the UK aggregate. (Chart 1.) 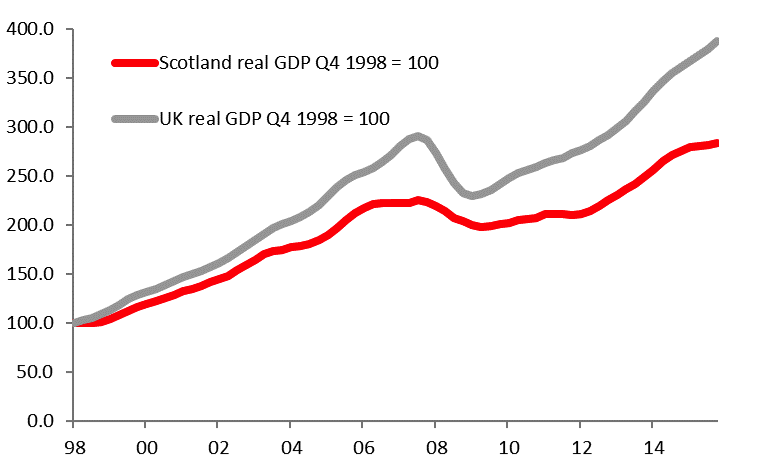 Since end-1998, the gap between Scottish real GDP growth and the UK as a whole is a cumulative 36.5%. (Chart 2.) 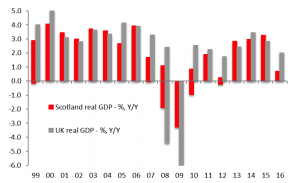 It is of course not a surprise that Scotland’s GDP growth has fallen behind the UK aggregate given the importance of London in driving the overall economy. Nonetheless, this represents a reality that can help frame the independence debate – that, other things equal, government revenues may be tied to a slower growing Scottish economy. This latter point is particularly important since an independent Scotland would inherit an alarming degree of fiscal weakness, an issue thatfiscal transfers from the UK currently mask. 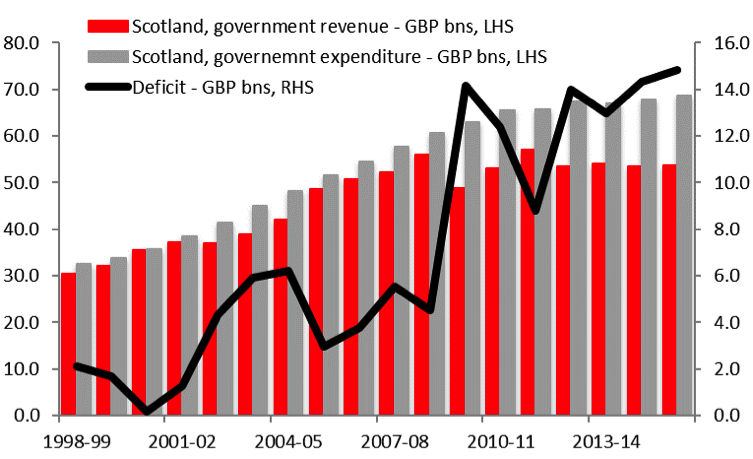 Particularly since the GFC, Scottish public expenditure has grown far more than revenues and resulted in a widening budget deficit. (Chart 3.) Including North Sea Oil revenues, in FY 2016/17 the Scottish budget deficit measured -9.5% of GDP compared to -4.0% in the UK as a whole. (Chart 4.) This would mean an independent Scotland being confronted with the reality of an aggressive and multi-year period of fiscal austerity – which would further reduce the country’s economic growth performance – as it tried to bring it’s budget deficit closer to the 3% of GDP levels stated in the Maastricht Treaty and the Stability and Growth Pact in order to facilitate EU accession. Chart 3. 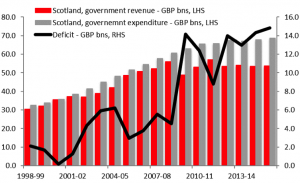 Scottish fiscal trends: rising expenditure, stable revenues. 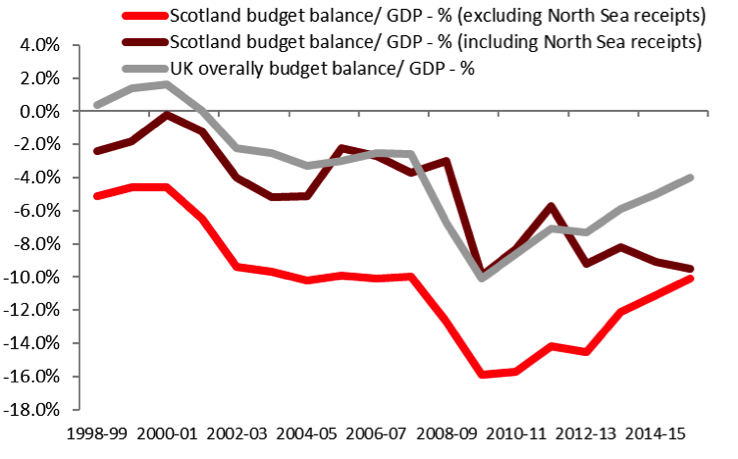 The lack of fiscal flexibility would also reflect the likelihood that Scotland would be required to absorb its GDP-weighted share of the UK national debt. 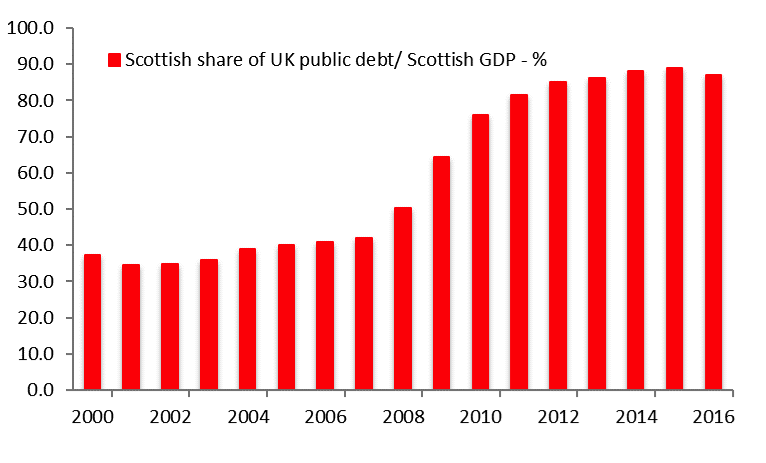 Chart 5 shows how Scottish debt/GDP would have looked over the past decade were it to be divided based on a relative share of Scottish vs. UK GDP over the period. 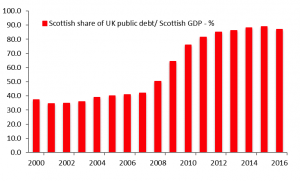 At end-2016, Scotland’s share of UK public debt would – if allocated on a GDP weighting – measure GBP136.5bn or 87.1% of GDP. (Chart 5.) Of course, an independent Scotland need not embrace the Conservative Party’s focus on austerity, an obsession that is expected to ensure that fiscal policy amplifies rather than smooths the economic dislocations of Brexit. However, given that a guiding principle of Scottish economic policy would be securing renewed access to the EU and given that this region remains firmly and ideologically committed to austerity, an independent Scotland may have less room to ease fiscal policy and allow public debt to rise than it may like. Fiscal policy would likely be deeply contractionary for economic growth. There are some specific reasons for the weak fiscal performance of the Scottish economy in recent years. Firstly, like most economies, the post-GFC era has seen a notable decline in the levels of economic growth. (Global GDP growth is 1pp lower post-GFC). (The potential for a USD overshoot.) This has naturally eroded revenue. However, the agreement to transfer funds to Scotland from the South has insulated the economy from the need to reduce spending. 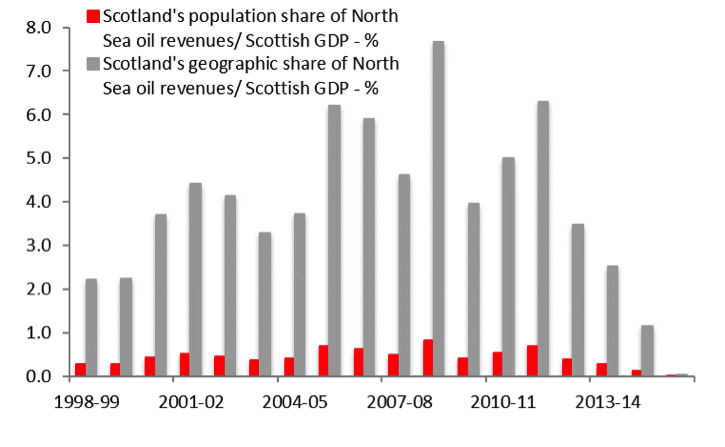 Moves towards giving greater powers of devolution to Scotland have exacerbated this trend and allowed for public spending per capital in Scotland to be around 10% higher than in the rest of the UK. Offsetting some of the economic and financial market risks posed by a wide external deficit would be Scotland’s share of the UK’s FX reserves. 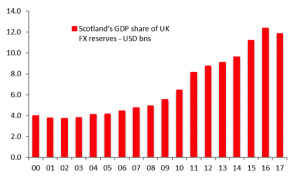 If Scotland were to obtain a GDP weighted share of reserves, as would be likely, this would amount to USD11.8bn or 6.1% of GDP. (Chart 9.) This would amount to less than one month’s coverage of imported goods and services, which reflects how so much of Scotland’s trade occurs with the UK. Clearly, the share of FX reserves would not represent a notable buffer with which to smooth FX volatility or – should the need arise – to maintain the flow of imports. Chart 9. The FX reserve holdings of an independent Scotland, based on a GDP weighted split. The core macro-economic backdrop for an independent Scotland would therefore be a weak fiscal and external liquidity position. This would reduce the policy flexibility of the government. 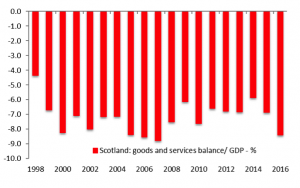 Most immediately, an independent Scotland would likely have to embark on an aggressive and multi-year period of fiscal austerity that would be expected to sharply weaken economic growth. The experience of the non-core countries in the Eurozone having to implement waves of pro-cyclical fiscal tightening come to mind as an example of what Scotland’s post independence policy framework might entail. The problem could be compounded by the choice of foreign exchange regime and monetary anchor made by an independent Scotland. An incorrect policy choice could impose on Scotland a monetary policy even more inappropriate to the needs of the domestic economy than was experienced by non-core countries in the early days of the Eurozone crisis, when former ECB President Trichet oversaw overly restrictive monetary policy settings. During the first referendum the UK government made it clear that an independent Scotland would not be able to continue using the GBP. This would prevent Scotland from “borrowing” the monetary credibility of the Bank of England, from benefitting from it’s expected multi-year path of loose monetary policy (The UK budget – hitting an economy when its down) and would expose Scotland fully to the implications of it’s weak external liquidity position. Scotland would therefore need to choose a new FX regime and hence a new monetary anchor. Scotland’s choice of currency regime: an FX peg should be ruled out immediately. In Scotland’s case, the country’s weak external liquidity position and likely weak growth outlook would pose problems for maintaining a peg, even one that was fixed after a maxi-devaluation of a new currency. Scotland does not have the FX reserves to credibly defend an FX peg, which would force a reliance on interest rates. High interest rates at a time of fiscal austerity would exacerbate the downturn in economic growth, raise questions regarding the longevity of the political will to defend a peg and could impose a risk premium on Scottish assets. The larger the initial maxi devaluation the more comfortable investors may be in believing that the peg was sustainable, but this would create the fresh problem of a surge in imported inflation driving down household real incomes and creating a fresh source of recession. An FX peg would appear to be an immediate path to a deep recession and the newly formed Scottish monetary authority may struggle to convince the market that the peg was sustainable. A more viable – but still unappealling – policy option for Scotland would be the most extreme form of an FX peg – a currency board. A currency board is an arrangement whereby a central bank, in theory, gives up all control of monetary policy. Domestic interest rates become solely a function of the prevailing balance of payments trends. If liquidity flows into a currency, the monetary authority is obliged to purchase foreign currency and print money to satisfy the increased demand for local currency and allow interest rates to decline. Similarly, if money leaves the country, a monetary authority meets the demand for foreign assets and in so doing shrinks the domestic monetary base and pushes up domestic interest rates. There should be no capacity for sterilisation of these flows. The power of a currency board is the lack of discretion for policy-makers. If a loss of confidence sparks capital outflows, domestic interest rates surge to levels that adequately compensate for the perceived risks of holding a currency. By contrast, investor enthusiasm for a currency can push interest rates sharply lower. Interest rates can remain at extreme levels until confidence in a currency normalises or – over a longer time-frame – until expansionary/ contractionary monetary conditions create the inflation/ deflation that can help restore domestic competitiveness. 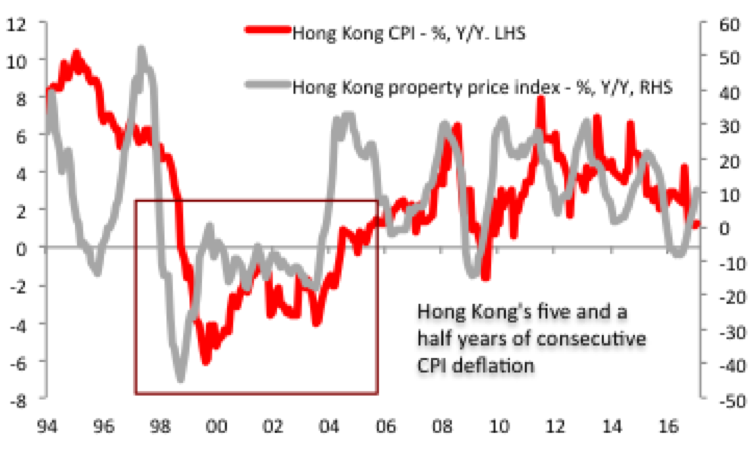 Chart 10 shows the effect of a currency peg on the Hong Kong economy. 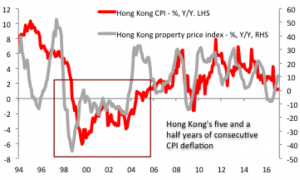 After the 1997/98 Asian crisis there were concerns about Hong Kong’s competitiveness. However, a sustained period of balance of payments weakness pushed up domestic interest rates and resulted in a period of CPI deflation that lasted from November 1998 to June 2004. A currency board would enable Scotland’s FX regime to have greater credibility than a simple FX peg. A currency board would also be consistent with Scotland’s low levels of FX reserves since interest rates would rise to levels that stabilised capital flows and prevented the need for FX intervention. A practical benefit is that Scotland would not need the UK government to approve a currency board peg to the GBP. The major drawback of a currency board is that volatility in FX reserves and exchange rates is replaced with volatility in domestic inflation, asset prices and in the real economy. Currency boards can impose deflationary periods of high nominal and real interest rates. Moreover, currency boards impose added pressure on a domestic financial system. The lack of a discretionary monetary policy means that there is no lender of last resort for a domestic banking system. This can be highly problematic during periods when there is a domestic recession and deflation and when the currency board creates an inverted yield curve. The rigours of a currency board tend to require banking systems to be heavily over-capitalised, which would impose an additional capital burden on Scotland’s banks, which would tighten monetary conditions further. If Scotland is willing to withstand these costs, then a currency board could become a viable exchange rate regime. Imposing a currency board after a maxi-devaluation of the new Scottish currency could also ease the adjustment process. However, the pressures of a currency board would be expected to ensure a bleak economic outlook in the months, quarters and posisble years after it was imposed. The deflationary aspects of a currency board in Scotland’s case would also complicate the process of fiscal austerity. A more realistic option for Scotland is to simply create a new currency and implement a floating exchange rate regime. This would have the virtue of allowing Scotland to conduct an independent monetary policy. The weak external liquidity position would drive the new currency weaker, but FX reserves would remain unchanged unless the newly-formed central bank decided to intervene by depleting FX reserves. Interest rates could be set for the needs of the domestic currency, although this would of course create the grounds for a sizable, initial depreciation of the Scottish exchange rate. The domestic economy could again be subject to a squeeze on real incomes caused by a rise in imported inflation, but the capacity for a subsequent recovery could be improved as loose monetary conditions could help to smooth the path of economic growth during a period of fiscal austerity. This option would also reduce the risks posed to Scotland’s banking sector as policy rates could be kept low and the yield curve steep, and as loose monetary conditions reduced the risk of a period of deflation. An additional cost of a floating exchange rate would of course be a sharply increased period of FX volatility. However, given the wild gyrations of the GBP over the past decade, Scottish companies would not be inexperienced at dealing with these risks. 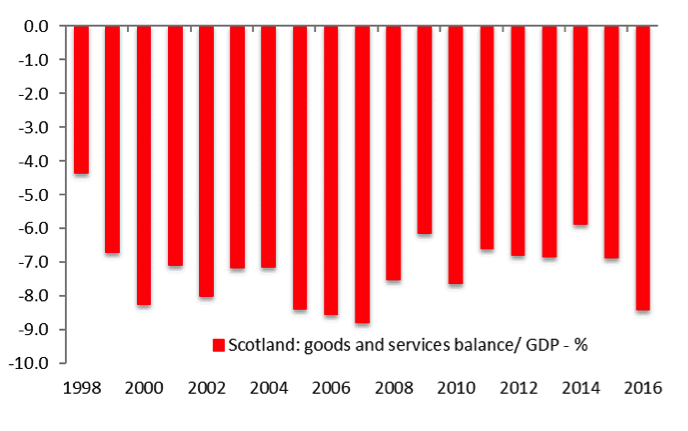 The structure of the Scottish economy suggests that the purely economic argument for independence is a weak one. An independent Scotland would be more fully exposed to the country’s fiscal weakness, and hopes for an EU accession would require an aggressive and multi-year period of fiscal austerity. The economic growth backdrop would likely be weak, and while choosing a floating exchange rate regime could enable monetary conditions to be supportive, the associated currency weakness would impose additional costs on the household sector as imported inflation lowered disposable incomes. Economically, Scotland would, in the quarters and possibly years following independence, be expected to face an extremely weak economic outlook. Economic arguments helped swing the independence referendum in 2014, but they might not hold as much power in a renewed vote. 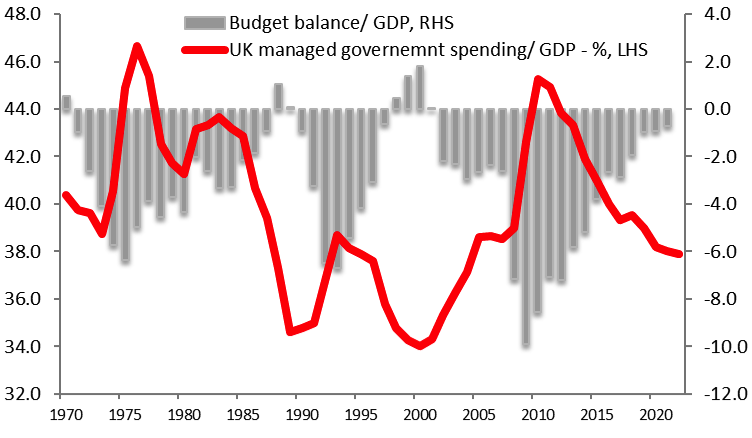 Critically, the UK is embarking on a multi-year period of fiscal austerity. Over the next 5 years, the government expected public spending GDP to decline from 39.6% to 37.9%, and as we have already noted this may understate the scale of the coming austerity, especially as the targets do not yet assume a hard Brexit. 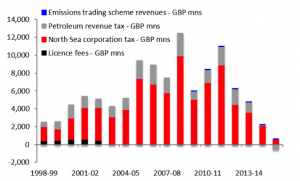 (The UK budget – kicking an economy when it’s down.) A drop in public spending/ GDP towards 36.0% within 5-years is possible, and longer-term the cuts could be even greater if the government enacted it’s suggested response to a hard Brexit, of slashing UK corporate and income taxes. (Chart 11.) This may still be milder form of austerity than an independent Scotland would face, but clearly the debate has shifted whereby the Scottish electorate would be choosing their favoured path of aggressive fiscal austerity. Brexit may also complicate a future referendum debate by allowing Scotland to claim that it will seek an expedited re-entry into the EU, and as an interim step regaining access to the common market. This would be seen to reduce the economic shock of Brexit and could also increase Scotland’s appeal as a location for FDI. While obtaining renewed access to the EU will inevitably involve a difficult period of negotiations, the very possibility of such as outcome would alter the nature of the debate in favour of the independence camp. The pro-union political push could be far more fractured than in 2014. A more practical consideration is that the campaign for Scotland to remain part of the UK would likely be far more fragmented than in 2014. Then, the Labour Party led the campaign, but paid a price in terms of a subsequent electoral drubbing in Scotland. Labour may be wary of repeating their leadership role. (Besides which, the current Labour leadership has limtied electoral appeal). The Conservative Party tends to have a low level of support in Scotland. This suggests that a fragmented and less focussed pro-UK coalition that would confront the SNP-led independence movement. All of these factors suggest that were a referendum on independence to be held over the coming 2-3 years, the result would be far closer than in 2014, despite that fact that the economic argument for independence remains weak. This implies yet another possible extension to the rolling period of uncertainty that will impact the GBP and UK markets over the coming years. In addition to Brexit disruptions, markets may have to consider thorny issues and risk factors such as the currency re-denomination of assets and liabilities were Scotland to gain independence and adopt a new monetary anchor. (The Eurozone’s Target 2 head-fake.) The unfolding issue of a renewed Scottish independence vote is – at this stage – merely the addition of a minor degree of uncertainty into UK markets. However, over, time we expect the issue will grow in importance and could in time come to displace Brexit as a driver of UK markets. The renewed risk of Scottish independence adds to our confidence in our long-standing forecast of GBP/USD falling to 1.05 and Gilt yields reaching fresh record lows. This entry was posted in Event Risks and Left Tail Events, Fiscal Policy Activism, Growth Crisis, Monetary Policy Expansiveness, Opportunities and Right Tail Events, Secular Commodity Dynamics by Des Supple. Bookmark the permalink.